While it’s easy to point to The White Stripes and The Strokes and declare with certainty that these bands saved rock n’ roll, I think it would be fair to say that both bands simply revived a sound that had been buried under a blanket of late 90s bubblegum pop and diluted alt-rock self-importance. And I don’t want to discount any claim of legitimacy on either band’s part, but as clear as their influences could gleam from their guitar strings and as legible as their music read like a bedtime story, blues rock, proto punk and garage rock were chapters already told and well-documented. One could say rock n’ roll in this instance had been regurgitated more than saved and this continues to be the case. Every band incorporates fragments of what came before into their own thing. It’s difficult to avoid having references, especially if you make music, and no one expects complete originality. The move, though, to “revive” as opposed to “begin anew” continues to be debatable. Post 2001, White Blood Cells and Is This It bred a throng of vintage-laced detuned blues duos and lo-fi garage dwellers. How many of these bands had anything new to bring to any movement or scene? How many of them produced albums that weren’t homogenized byproducts of the times that informed their sound? The 2000s did seem an era devoted to nostalgia and while very new sounding, very interesting and exciting bands and performers emerged and attempted to make their respective marks, from a rock perspective, it’s difficult to associate those years with anything other than the softening of indie rock and the reverb from vintage amps. Oh, and Coldplay. When I heard the lyrics “I like to be informed of what’s next/I wanna know what’s in store” from The Men song, Oscillation, this observation seemed to lend itself to the attitude of the last ten years, the predictability of the mainstream to glom onto trends and kick it out with factorial indifference. Granted this aspect of the music industry has been a standard proven to be both beneficial and unfortunate as long as music’s been in print, but Open Your Heart, the third album from New York rock quartet The Men, made me wonder if the mainstream will pay attention THIS time. And then I remembered that the industry is getting a lot of mileage out of The Black Keys right now and I snapped back to reality. But, why be cynical? 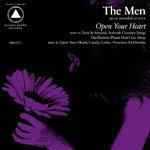 In the face of all that’s become commonplace and forgettable, The Men’s Open Your Heart has the good sense to utilize its influences as a means to go forward, cultivating an eclectic albeit consistent brand of independent rock n’ roll music. I don’t think it would be a stretch to say The Men were picking up where The Replacements left off, even if I am ignoring a decade’s plus length of time between the band’s dissolution and the aforementioned garage revivalism. But, I think this point is driven home with Open Your Heart as you hear country influenced, proto-based punk rock that dabbles in the Daydream Nation. As babyboomer hippie rock has for years fellated itself in the face of all that’s come afterward, especially the movement of 80s independent rock and 90s alternative music, The Men’s inventive blend of the MC5, Roky Erickson, Paul Westerberg and Sonic Youth levels the impact, putting something like Kick Out The Jams in the same league as The Replacements’ Let It Be, legitimizing rock’s evolution in terms of its milestones and not in terms of its age. Beginning with Turn It Around, an MC5 tinged rock track fueled by melodic guitar licks and high tempo, Open Your Heart maintains its energy with Animal, a slide guitar carving through Southern hard rock. Vocally indecipherable, musically rambunctious, Animal is followed by the near 6 minute Country Song, an appropriately titled instrumental piece that amusingly evokes barren tundra and tumbleweeds. Country Song bleeds into the Sonic Youth-layered introductory jam of Oscillation, high frequency noise riffs momentarily losing the music’s stride around the 5-minute mark just before the band decides to add lyrics. A rather versatile mash of sounds that borders on the alienating, The Men follow their most avant-garde offerings with the punk-laced indie rock tracks, Please Don’t Go Away and Open Your Heart, both of which exude the sort of loose and loud pop constructs of Dinosaur Jr. or latter-day Replacements. Candy’s casual folk rock strum and Cube’s 3 minutes of abrasive guitar sounds precede Presence, Open Your Heart’s alt-country rock opus. At its essence, the song is one riff accompanied by notes wandering and improv’d as the tension builds. Vocals harmonize, percussion ensues, its one idea flourishing as tempos change and guitar tracks interact. With Ex-Dreams, a Thurston Moore style vocal and a solid array of guitar work carry the album to its closing. Keeping in mind the wealth of music we as music fans or record junkies have either heard or want to hear, has rock music ever really needed to be saved? When people’s ears perk up and a wave of awareness signals the dawn of some new thang, the catalyst behind these momentary lapses in the public’s collective coma often gets treated as a cultural eureka. Same thing happened with Nirvana, even though a decade’s worth of college radio was churning out the seeds of Nevermind long before it had come to be. And while The Men’s Open Your Heart encapsulates a varied and fruitful amount of rock’s best moments as well, there’s something to be said for a band that places rock’s elder statesmen in the same league as its pupils, realizing that, through its youth, rock has remained important. The old guys had it right, but the young guys did, too. If more bands would realize this, rock would never need to be saved. It would keep going and the saving would be reserved for its public.